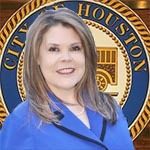 The Administration and Regulatory Affairs Department (ARA) provides a wide variety of administrative services to the City of Houston’s departments, such as 311 service request routing, payroll processing, asset disposition, citywide policy management, internal mail services, records management, and insurance risk management. ARA also regulates a wide variety of activities such as on-street parking, pet ownership, vehicles for hire, investor-owned utilities, the City’s public rights-of-ways, burglar/panic alarm ownership, sexually-oriented businesses, scrap metal dealers, game rooms, and many others. The department also coordinates the City’s activities aimed at building a sustainable city for the future.